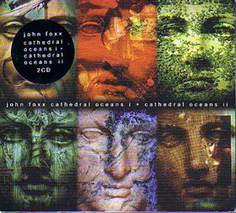 Cathedral Oceans I and II go together well in this double album set. The second Cathedral Oceans volume continues with the same sound and style as the original, making a perfect continuation. One of the main highlights of Cathedral Oceans II is the album's beautiful opening piece, "Revolving Birdsong". As always the titles are fascinating, and the dreamy imagery that the music projects in the mind, is all part of the unique and almost spiritual Cathedral Oceans experience. Through this double album, the bigger picture is starting to form, with tracks such as “Stillness and Wonder” and “Golden Green” really portraying the passing of time and the effect of nature around us. Crumbling stonework and tangled ivy are some of the various images that spring into mind through the music here as well as the eerie ambience of Foxx’s original vision of a sunken cathedral, submerged underwater, overgrown, lifeless and decaying; sinking into the ground and returning back to nature. Cathedral Oceans II is not currently available on its own.